The Derry Under 21 hurlers line out before Saturday's All Ireland U21 B final against Kerry in Nowlan Park. All Ireland Under 21B Hurling Final. 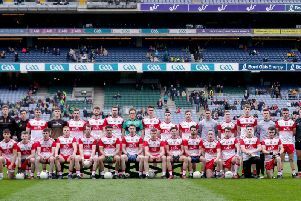 Derry’s first shot at the Richie McElligott Cup fell at the final hurdle in Nowlan Park on Saturday where they lost to reigning champions, Kerry, in the All Ireland Under 21B final. The winners led 1-9 to 0-6 at the break, but found another gear in the second half to run out 15-points victors at the expense of a gallant Derry team in its first participation in the competition. Despite arriving in Kilkenny as rank outsiders, it was a solid and regimented opening for the Oak Leaf County. Defensively they were sound – good in the air, quick over the carpet and strong in the tackle – curtailing a very pacy and potent Kerry attack. Ruairi McCartney, Conor Kelly and Eoghan Gilmore all went toe to toe with a trio of flying Kerry forwards, while John Mullan, full of heft and heart, and the consummate Shane McGuigan provided an extra layer of Oak Leaf fortification in the half back line. And in goalkeeper Seán Kelly, Derry boasted a young man at the top of his game and a serious prospect for the future. And while the Oak Leaf attack, missing key man Brian Cassidy through injury, was mainly living off scraps, the free-taking prowess of Richie Mullan was keeping the underdogs very much in touch. With the Kingdom’s hot breath on their necks, Derry refused to panic. However, with the first half in injury time, Kerry’s Jordan Conway finally broke the shackles and slipped home the only goal of the half to hand the Kingdom a decisive six point advantage. But there would be one more twist in the tale as Kerry were reduced to 14 men with the dismissal of influential midfielder Fionán Mackessy for an off the ball incident. Derry manager Collie McGurk took issue that the controversial goal was allowed to stand. There was little to separate the sides in the opening exchanges with Kevin Lynch sharp-shooter Mullan replying to any Kerry points to see the score 0-3 after seven minutes. After that Kingdom began to find their groove and sped away to lead 0-9 to 0-4 by the 25th minute. Derry refused to blink at Kerry’s cold stare, and points from Corey O’Reilly and another from Mullan left Derry three behind before Conway’s late half goal doubled Kerry’s lead. John Mullan opened the scoring for Derry to get the second half going but after that points were few and far between for the Ulster men. Kerry, by contrast, attacked the second half with grievous intent, stretching their lead continually throughout the half. Shane Conway was eagle-eyed in his free-taking, with Eoin Ross scoring their second goal in the 53rd minute. Corey O’Reilly, Odhran McKeever, Sean Cassidy and Declan Quinn all raised white flags for the Oak Leaf County but it was never going to be enough to stem the Kerry tide. Show me a good loser, and I’ll show you a lose but even with the contest now a busted flush, Derry refused to surrender – harrying and harassing Kerry players right to the final whistle. The sight of teenager Richie Mullan diving full length to block a Kerry clearance deep into injury time all but summed up Derry’s inspirational season, that already boasted mighty victories against Mayo and Meath, and all on their travels. The All Ireland final defeat brought an end to a very healthy campaign for Collie McGurk’s young men. “We’ve made progress this year. We need to be getting these fellas to senior grade as quickly as possible. Kerry were a huge side physically and they were in superb physical condition, and maybe that something that our fellas need to have a look at as well.